How big are fantasy role-playing coins? In older editions of D&D, there were 10 coins to the pound, and since different metals have different masses they would vary in size. In more recent incarnations there are 50 coins to the pound, and I’ve often used 100 coins to the pound to keep things more realistic (yeah, I know) and to make encumbrance accounting less of a chore. If you peruse the internet you can find a fair amount of information on ancient and medieval coins, how much they weigh and how much they were worth. For the purposes of a game, none of the minutia of coinage is all that important. One can simply imagine a “gold piece” to be an expression of weight (and therefore value) rather than a coin itself. A chest of 100 gold pieces could contain a thousand delicate golden leaves minted by the elves or 10 large trade coins used by the merchants of Antigoon, the city of merchant-princes. It could also be two or three bags of gold dust or a large gold plate. Doesn’t really matter. But, since it’s fun to imagine the things your players find while delving into their neighborhood mythic underworld, the following picture might be of interest. It depicts several different thaler coins (the forebear of the dollar) along with a modern U.S. quarter for size comparison. These coins might represent the 10 gold pieces to a pound coinage of OD&D. 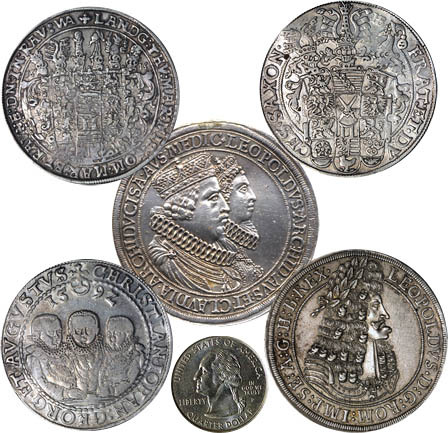 In fact, the real coins pictured above would come in a bit lighter than that, but their existence at least makes such large and heavy coinage not entirely out of the realm of possibilities. In my own game, I went back and forth with coin size, weighing the cool factor of giant coins with the logistical problems of toting them around. After all, I wanted the focus of the game to be on exploration rather than logistics, and I had a group of players that weren’t terribly excited about hiring mules, mule drivers, torchbearers, etc. I finally went for the 100 coin pound, but had I to do it all over again, I think I might go for the 10 coin pound. And check out the lower lip-chin on that mug in the lower right-hand corner. The reformation was not kind to the royal gene pool in Europe.